The NHL has begun to release their nominees for the annual individual awards, starting with the Calder trophy today. The award is handed out to the league’s best first year player, and Edmonton Oilers rookie Ryan Nugent-Hopkins is among the three candidates. 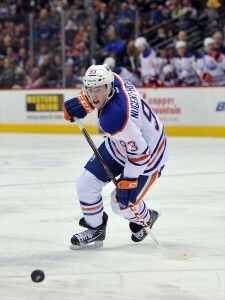 Nugent-Hopkins finished the season tied for the rookie lead in points with 52, despite playing in just 62 games. He averaged .84 points per game, which means that had he played all 82 games he would have been head and shoulders above the rest in points. Unfortunately, an injury limited his season, and may ultimately cost him the trophy. His biggest competiton is Colorado Avalanche forward Gabriel Landeskog. Viewed as a more complete player at just 19 years old, Landeskog was a big part of his team’s playoff push, though they ending up falling short. Rounding out the top three is New Jersey Devils freshman Adam Henrique. The only one who’s currently in the post-season, Henrique finished the year with 51 points in 74 games filling in for Devils injured top center Travis Zajac. Some view this as a two horse race; in fact many don’t agree with the third nominee. Matt Read of the Philadelphia Flyers notched 24 goals, the most among first year players, but didn’t get nominated. The fact that he’s 25 years old may have played a factor. Henrique has excellent numbers as well, but voters may look at the fact that he plays for a such a good team and has superior line-mates as a deterrent. Nugent-Hopkins, the youngest of the three, will no doubt get some serious consideration for the award. He plays the game with a maturity way beyond his years. He has poise with the puck and great play-making ability. The only knock against Nugent-Hopkins is the fact that his defensive game struggled. The case for Landeskog is the fact that he excelled offensively while killing penalties and playing strong defensively, something that isn’t a given among NHL freshman trying to learn the game. Will the voters be swayed by the fact that Nugent-Hopkins finished with the same amount of points as Landeskog despite playing in 20 less games? Or will the Landeskog’s stellar play at both ends of the ice put him over the top? The Oilers were a much weaker team, but the Avalanche were in playoff contention right to the end, putting more pressure on Landeskog to perform. Nugent-Hopkins would be honored to receive the award, but he has some stiff competition. Who will the voters choose? Find out on June 20th in Las Vegas.